On June 18, at Oak Creek Golf Club in Irvine, more than 200 guests are expected to attend Children's Bureau's annual Clambake event featuring inspired cuisine and cocktails, dancing under the stars, live and silent auctions, heads and tails game, wine pull and other clam-filled surprises. "What makes our Children's Bureau Clambake so special is that 6000 vulnerable young children and their families are sparred from child abuse and given lives filled with opportunities." 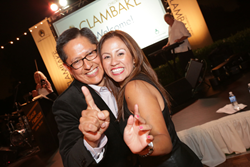 Children’s Bureau Clambake is diggin’ up funds for Children’s Bureau on June 18 at Oak Creek Golf Club in Irvine. More than 200 guests are expected to attend the popular charity event featuring inspired cuisine and cocktails, dancing under the stars with the Dwight Kennedy Band, live and silent auctions, heads and tails game, wine pull and other clam-filled surprises. Event honorees are Ingram Micro, Inc., Peggy Goldwater Clay and Youth Action Council. The night is expected to raise $175,000 net for Children’s Bureau’s child abuse prevention programs in Orange County. Event sponsors to date include gold sponsor, Ryan Turner Specialty, silver sponsor, Samsung, bronze sponsors, QBE, The Capital Group Companies, Disneyland Resort, Grandpointe, Deloitte, and Change a Life Foundation, table sponsors, Ingram Micro, Windes, Peerless AV, Kensington and Sierra Nevada Investment Group. Tickets are $250 per person. For more information or tickets, please visit all4kids.org/clambake. Follow us on Facebook for a chance to win two tickets to the event at facebook.com/childrensbureau. “What makes our Children's Bureau Clambake so special is that 6000 vulnerable young children and their families are sparred from child abuse and given lives filled with opportunities,” said Alex Morales, President and CEO of Children’s Bureau. Children’s Bureau (all4kids.org) helps more than 6,000 at-risk children and parents each year throughout Orange County with a variety of programs and services such as in-home counseling, parent education classes, collaborative participation in family resource centers, home visiting health programs, family foster care and adoption.